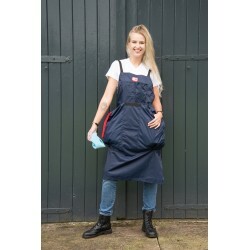 Apron with large towel pockets waterproof. Our apron with towel pockets is a very popular apron used a lot in the milk-parlor. The large towel pockets can hold up to 30 towels each and have a small hole in the bottom to drain water.